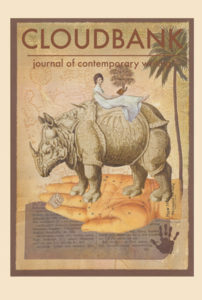 Cloudbank 12 includes poetry by Kimo Reder, Kirsten Rian, Amy Bracken Sparks, and many others. Book reviews for Lichen Songs: New and Selected Poems by George Venn, OK By Me by Sheila Sanderson, and Physics for Beginners by John Peter Harn are included. secret breath. I am living next door to Hart Crane. or maybe the mouse represents Peter’s ego. He and I had many wonderful times together. and talk about what will become our “online” journal. Peter and I worked together for over twenty years. We started Cloudbank Books in 1999 with the publication of Millennial Spring: Eight New Oregon Poets. We traveled up and down western Oregon—from Scappoose to Klamath Falls—to sell and promote the book. Thirteen other books followed, along with Cloudbank, the journal, launched in 2009. I’m like the snow at night in the field. Most of the time you can’t see it, then it glistens. I came in and found the moonlight lying in the room. The associative leap from snow to moonlight worked for me, especially with the title of Bly’s book providing the link. The rhythm in both lines (6 beats) is similar and the way the words work together—“light”, “lying” in Bly’s poem and “most”, “glistening” in Peter’s poem helped me make the jump. How words work together by echoing each other is part of the magic (and music) of poetry. the person isn’t leaving, I am. and I’m smaller, lighter, and passing through. and perch along the equator—for luck, for love. tells me he still cries alone in his room a lot. through air in place of your apology for leaving us here.